Astronauts have completed their third and final spacewalk of the current shuttle mission to the International Space Station (ISS). American Robert Behnken and UK-born Nicholas Patrick finished a five-hour 48-minute outing to put finishing touches to the Tranquility Node. Among other tasks, they prepared the module's new observation deck, or "cupola", for its first opening. Tranquility represents the last major component in the building of the ISS. Besides a good deal more space, Tranquility will provide ISS astronauts with an unprecedented view of the Earth and of approaching vehicles that the station has lacked until now. 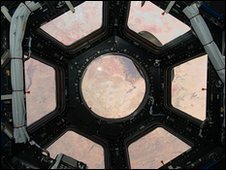 The seven-windowed cupola includes a central window of nearly 80cm diameter - the largest ever sent into space. The Tranquility Node houses a range of life-support systems, an exercise machine, a toilet and a pair of workstations for manoeuvring robotic equipment outside the station. 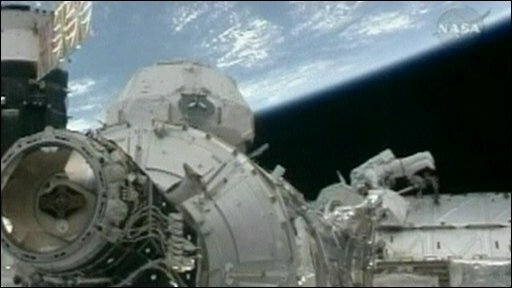 The node was first installed on Friday and the first two spacewalks were undertaken on Saturday and Sunday. During those operations, Tranquility's cooling and electrical systems were connected. The ISS's robotic arm was used to relocate the cupola from the "far side" of the space station, where it had been placed for launch, to the Earth-facing side. Tuesday night's spacewalk finished off the commissioning of Tranquility, removing heater cables that are no longer needed, connecting a secondary cooling system and installing six handrails outside the node for the benefit of future spacewalks. The cupola's thermal blanket was taken off in two pieces and stowed, and the "locks" that held its shutters in place against the forces of launch were removed. With the shutters free to move, the astronauts were able to open them and look through the cupola. The first photograph taken through the windows and sent to Earth showed the Sahara desert. Space shuttle Endeavour will un-dock from the ISS on Friday and is expected to land back in Florida on Sunday. Four more shuttle missions will be undertaken over the next seven months to deliver further equipment to the ISS, after which the venerable shuttle fleet will be retired.